When it comes to bookkeeping for your business, you’ve got a lot of options. Many small business owners are moving to cloud accounting software, and with good reason. It’s accessible anywhere – not just on your computer, but on your bookkeeper’s or accountant’s computer too. 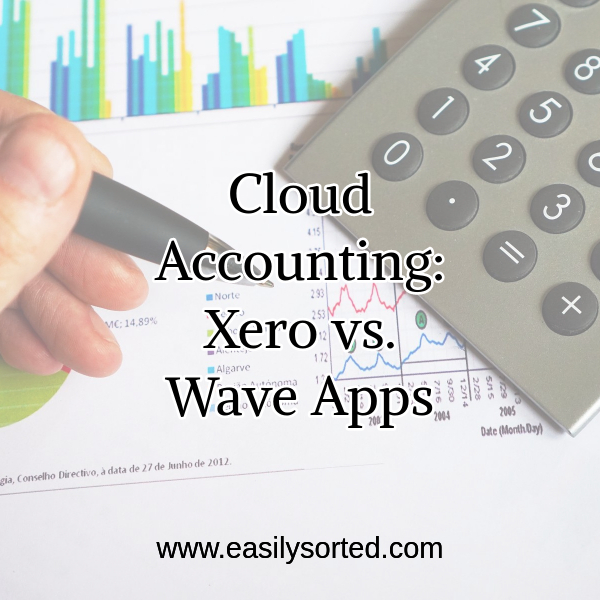 So today I’m going to be talking about two cloud based accounting apps that I’m familiar with – Xero and Wave Apps. Both have invoicing capabilities and bank feeds available. 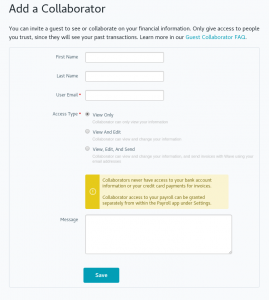 Both let you give access to other people – say your bookkeeper, accountant, payroll officer, etc. Both are fairly easy to set up, and easy to start using. But the way they do things is slightly different, and that’s what you need to think about when choosing a cloud accounting system. Wave is free cloud accounting software. Yes, free! It’s very simple to set up and get started. You can find everything in the sidebar menu. All the settings you need to know about are in the settings menu item. You can customize your invoices, add collaborators, and set up tax rates. You can create invoices, send, and even schedule them to recur. Attaching documentation to transactions is easy – just go to the Bills or Receipts section and follow the instructions. Then, match each one up with the transaction from the bank feed and reconcile. Since Wave is free, you can add a test organisation anytime you want, and play around with it to get the hang of things. You can add multiple businesses – as many as you need! Xero is what I use for my business. It was the first cloud accounting software I ever used. At the time, I didn’t know any others existed. 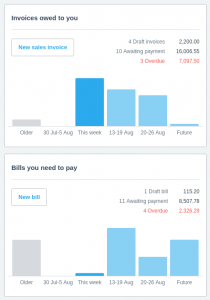 Xero has all the features of Wave Apps, and then some. 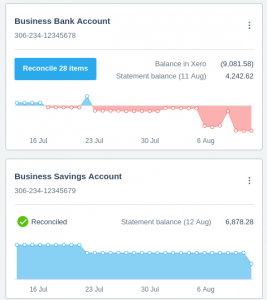 When you first login to Xero, you’ll see your Xero dashboard, which can be set up however you want. By default, it shows you your bank accounts with balances, an overview of any outstanding invoices & bills, and a ‘total cash in and out’ module. You can add and remove whatever you like from this dashboard. For instance, if you want to keep some bank accounts hidden (so the money isn’t in your face tempting you every day! ), you can do that. You can add income & expense accounts to the Accounts Watchlist to keep track of how you’re doing in a particular area of your business. Xero also integrates with many other tools, such as WooCommerce, Shopify, Mailchimp, Microsoft Office, G Suite…and Zapier for anything else that doesn’t have a custom integration already! Depending on what subscription you have, you can work with multiple currencies, automated superannuation, and payroll for multiple employees. When you add a new person to your organisation, you can choose the access you give them from several options. Not sure how to use the features, and don’t want to screw it up? No worries. Just load up the Demo Company and have a play! 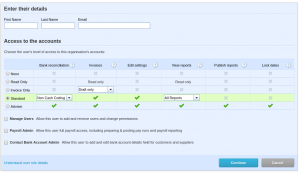 So which cloud accounting should you choose? I can’t tell you this without getting in trouble with the ATO & Tax Practitioners Board for giving financial advice. But here are a few questions to ask yourself before you choose one. What’s my budget? Wave is free, but plans with Xero start from AUD $25. Will I be able to set up bank feeds with my bank? Wave may not connect with all Australian banks (for instance, it doesn’t connect yet with the bank my husband and I use for personal finances). Who’s going to be doing my books? If the answer is you, then you’ll need a system you can understand. 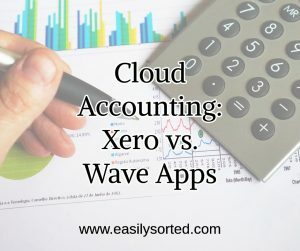 Wave is definitely simpler to work out than Xero, but Xero may be worth the extra time to learn if you need its extra features. Do I need access on the go? Both Wave and Xero have iPhone and Android apps. You may want to test them out before you commit to one or the other. 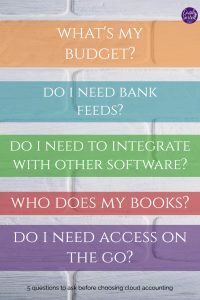 Do I need to integrate my accounting with other software? Xero definitely has more options for this than Wave, but Wave can still integrate with other things via Zapier. 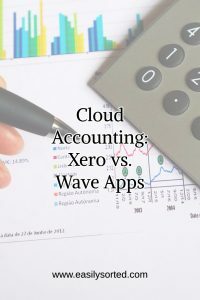 A note: Xero and Wave are not the only two cloud accounting systems. You could also look at MYOB, Intuit, Reckon, Sage, and others. I have no experience with any of these, but one of them may be great for you, so don’t overlook them!